Cuisinox has created a premium grade stovetop espresso coffeemaker with a distinguished style and hand crafted to the highest possible standards in the industry. 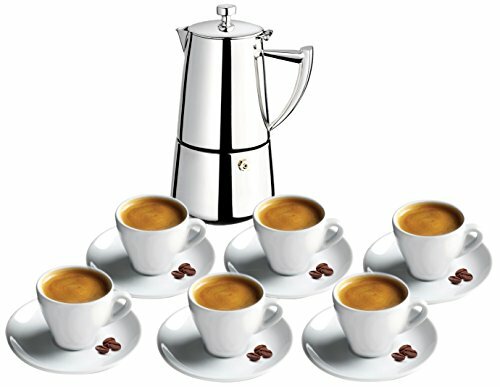 Featuring a heavy gauge 18/10 stainless steel construction polished to a mirror finish it compliments our Italian pear-shaped espresso cups. Most requested of all espresso cups in a traditional pure white porcelain with an extra thick wall. If you have any questions about this product by Cuisinox, contact us by completing and submitting the form below. If you are looking for a specif part number, please include it with your message. La Conica Espresso / Coffee Maker in Mirror Polished by Aldo Rossi Size: 9.25" H x 2.95" Dia.